This has been an outstanding summer for produce, and while some vegetables have had their ups and downs, we still have a nice variety of items available. What we really have a lot of right now is winter squash. 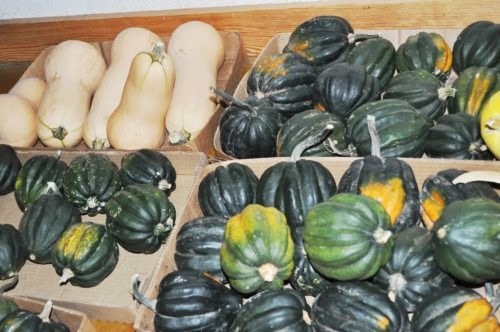 I will soon be posting some of my favorite winter squash recipes for spaghetti squash, butternut squash and acorn squash. You do not want to miss the Butternut Squash and Ham Bisque recipe – it is out of this world! We also still have tomatoes, and now bell peppers and jalapenos are in season. We still have cucumbers, and a few summer squash. And most exciting – we are now selling honey! Look for us at the Ark City Farm and Art Market today, and at the Walnut Valley Farmers Market on Saturday.